If... Then You Are Saved! GLENN IN ORBIT - What does it MEAN? The Bible is the world's best-selling book. Is it only great literature or "the Word of God"? • Claim to foretell the future. • Promise that humans can receive the gift of eternal life. • Reveal the way to true happiness. • Explain why humans suffer. • Teach the real purpose of life. • Show how men and women can ultimately defeat human weaknesses, problems and fears. • Declare that God created all things. This and much more can be discovered in the pages of what some call the greatest book ever written. The Bible is an astonishing book when one looks at the way it has been put together. It's as though the Bible assembled itself over a long period of time from many interlocking pieces. Yet, they were composed by men from totally different backgrounds, cultures and time periods. The biblical authors included kings, statesmen, fishermen, priests, seers, a physician, a tax collector, a farmer, a general and a tent-making rabbi. Four books record the life of a carpenter-turned-teacher, whom the Bible declares to be God in human form. How did these fascinating writings we call the Bible originate? How did they manage to survive thousands of years — often preserved and transmitted by those who did not believe them? Who really wrote the Bible's various books? Is the Bible's writing God-inspired and directed? Disagreement about these questions has torn apart more than one Protestant denomination. It has also caused disagreement among Catholic teachers. Opinions are divided sharply. Some scholars accept the Bible as the infallible word of God. Others try to extract what they consider the original teachings from later additions. Still others see the Bible as just another literary book. And there are varying views in between. The controversy involves virtually the entire text of the Bible. Some researchers, for example, assert that many of the sayings attributed to Jesus did not come from him. Some discount the miraculous events mentioned in connection with Jesus' life. Others question whether Moses really wrote the material found in the first five books of the Bible. One view asserts that the books of Moses were compiled in an effort to merge competing schools of thought. Some Christian and Judaic scholars seem untroubled by this possibility—that the Bible could be just a work of humans. Others say this idea is blasphemous. Can you be sure whether the Bible is divinely inspired or only the creation of well-meaning but misguided individuals? For a moment, let us suppose humans put pen to writing material and inked their own ideas, making empty claims in the name of Yahweh or Jesus. True, we might agree with some of their moral principles. Then again, we might accept some of the great moral principles given by Muhammad or Buddha, Confucius or Plato, Abraham Lincoln or Albert Schweitzer. The Bible, then, wouldn't have the weight of God's authority. Can we indeed know whether the Bible is stamped with the impress of God's inspiration? Did God guide the writing, preservation and transmission of his message to mankind? Many believe that God did direct the writers by literally speaking to them. Others consider this idea absurd. What is the truth? The biblical writers continually challenge us on the crucial point that they wrote God's words. They do not say the books came by mechanical writing or automatic dictation. They do claim, however, that they heard God speak. Moreover, the Bible writers also claim miraculous happenings occurred, which they ask us to believe. As Bible readers it is we who are forced to decide whether these extraordinary events happened or were simply manufactured. didn't. Either Jesus raised Lazarus from the grave or he didn't. Either Jesus was resurrected or he was not. Let's look at some events from the Old Testament. We're faced with the same bewildering choice. Either the Red Sea parted and the Israelites crossed it with dry sandals or the sea didn't part and there was no such crossing. Either the sun stood still during Joshua's long day or it didn't. Either the walls of Jericho tumbled or they didn't. If all these events happened as described, they could only have been caused by the hand of a supernatural being. Time and again, individuals who wrote the text of the Bible claimed they were merely dutiful scribes. They said they were simply recording the words of God. They were declaring en masse: These words are inspired by God. One Bible researcher counted more than 3,800 times when the writers of Scripture used some variant of the formula, "The Word of the Lord came to me, saying...."
Now, that seems to be a rather extravagant claim. Or is it? God, or the Lord, these ancient scribes stated with clear-headed authority, had actually communicated his message to them. Some examples: Ezekiel said, "Now the word of the Lord came to me, saying..." (Ezek. 6:1). Amos often repeats, "Thus says the Lord...." Several books begin with the introductory statement: "The word of the Lord that came to...."
Much of the Pentateuch is presented as the actual, spoken word of God. Over and over the phrase is used, "And the Lord spoke to Moses, saying...." In Exodus 33:11, we even read, "So the Lord spoke to Moses face to face, as a man speaks to his friend." Did this really happen? If your friend were to tell you, "God has just spoken to me...," you'd begin to wonder about your friend's sanity. Yet, most writers in the Bible claimed that God had communicated with them. The apostle Paul is considered to be one of the spiritual giants of Christianity. He wrote more books of the Bible than any other author. Paul said he saw and spoke with Jesus after his death and resurrection. "Have I not seen Jesus Christ our Lord?" he challenged the Corinthians (I Cor. 9:1). Paul and the other apostles claimed their message had come directly from Jesus (Gal. 1:12). John said the visions and words he recorded in the book of Revelation had come from God (Rev. 1:1). Can We Trust Their Testimony? Had these individuals been out in the Holy Land sun too long, and were they hallucinating? Were they deceived, or were they simply lying about talking to God or having revelations? But let us say the Bible is really the word of God ... the word of God. Do we realize who its author would be? Why, the One who created everything that exists. We would sit up and listen to what he was saying—alter our thinking—change our lives. That's exactly what the Bible says happened. Millions of people, we are informed, were told by God directly how they should live their lives. We read the remarkable biblical claim that all the people of Israel heard God talk to them from a mountain in the Sinai desert. Imagine a supreme and sovereign being called God thundering out the Ten Commandments from the top of Mt. Sinai. That's what the book of Exodus claims. Suppose the Mt. Sinai event really took place? If the eternal God himself wrote the Ten Commandments, then they bear the highest authority in the universe. If God really wrote those words, we would have to acknowledge they have authority in our lives. That goes for the rest of the Bible as well. Much of the Old Testament is said to comprise the actual words that God spoke to humans. Consider the following claims. The last 27 chapters of the book of Isaiah are written as though they were actual words delivered by God. It's as if God sat down and wrote a long letter to humanity. In this "letter from God," we read his awesome claim time and again. Here are three examples. "I, even I, am the Lord, and besides Me there is no savior" (Isa. 43:11). "I am the First and I am the Last; besides Me there is no God" (Isa. 44:6). "I am God, and there is no other; I am God, and there is none like Me, declaring the end from the beginning, and from ancient times things that are not yet done" (Isa. 46:9-10). Are these really the words of a God powerful beyond imagination — communicating to humans? The Old Testament writes about God as someone who walked with and spoke to humans face to face. The Lord spoke to Adam and Eve (Gen. 3). He even had a conversation with the first murderer, Cain (Gen. 4:5- 15). The Lord communicated to Noah as well (Gen. 6:13-21). He talked and walked with his friend Abraham and with Abraham's wife, Sarah (Gen. 18). And so on. Of course, it shouldn't surprise Christians that the Bible writes about individuals seeing God in human form. The book claims that God walked the earth as a human being, working, sleeping, laughing, crying, touching, healing, teaching and finally suffering and dying. Then, says the New Testament, this man Jesus was resurrected to glory. Let's look again at our basic problem when deciding whether God is the real author of the Bible. We are faced by a book making supernatural claims. But we are only human. How can we mere mortals possibly know whether the Bible is the word of a God to the human race? Glinter Grass, the German writer, once put the dilemma well. "I don't know about God," he said; "the only things I know are what I see, hear, feel and smell." That's the way it is with the Bible. It talks about a Being none of us has seen or heard. The book discusses specific events none of us has experienced. The most recent events mentioned in the Bible would have happened 1,900 long and dim years ago. Moses did? Or Abraham? Or Jeremiah? Or Peter? Or Paul? Millions of intelligent people have read the Bible and have sincerely believed it to be the word of God. Many have said so publicly. Daniel Webster, an American statesman of the last century said, "The Bible is a book of faith, and a book of doctrine, and a book of morals, and a book of religion, of special revelation from God." Yet, in a Gallup poll in the United States, only 11 percent reported daily reading of the Bible. "Our frequency of Bible reading has remained virtually unchanged over the years.... People revere the Bible, but they don't read it," concluded George Gallup Jr. Still, Americans maintain an outward reverence for the Bible. How do your Bible reading habits and your beliefs compare with the American public at large? In 1978 Gallup found that 42 percent of the American population professed to believe that "the Bible is the word of God and is not mistaken in its statements and teachings." But only 30 percent claimed to read the Bible even once a week. Another poll of Americans found 38 percent claimed to believe the Bible is the actual Word of God. Only 14 percent saw the Bible as an ancient book of fables, legends, history and moral precepts recorded by humans. A mere 1 percent believed God had nothing to do with the Bible. A more recent poll by the Gallup organization reports that about one third of all Americans believe the Bible is the literal "word of God." In 1963, about two thirds held to this belief. No person living in the Christian world—whether in Europe, Latin America or the Anglo-Saxon nations—can escape a basic fact. This singular Book has shaped our destiny to a large degree; it continues to do so. We are faced with a unique work that has had an awesome influence on human society. It is a one-of-a-kind book in many ways. It was written and preserved over thousands of years and straddles incredibly diverse cultures, beliefs and teachings. Despite its great diversity, the Bible reflects remarkable unity. What are we to do about the Bible, then? Isn't it worth our time and effort to examine the message that unfolds in its pages? Read its words, ponder its thoughts, evaluate its promises. Give it the respect it deserves. Come to know the God it reveals. The Bible is the best-selling and most doled out book of all time. 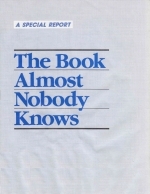 The United Bible Societies (DBS) estimate they have distributed nearly 9 billion Bibles, whole or in part, since 1947. In 1989 the American Bible Society distributed more than 106,387,551 Scripture portions in the United States alone. During the same year, a worldwide partner-ship of Bible societies distributed well over 650 million Scripture portions and about 15.5 million Bibles. In 1988, the 1,000th anniversary of the baptism of Prince Vladimir of Kiev, the Soviet Union, in an agreement with the UBS, received hundreds of thousands of Bibles. The UBS distributed 337,775 Bibles in the Soviet Union in 1989 and 596,300 in the first half of 1990. Through 1989 at least one book of the Bible had been translated into 1,928 languages since the invention of printing. Today, virtually every person on earth has available at least portions of Scripture in his or her native tongue. The Bible is, some calculate, a $200 million-a-year retail market in the United States. By 1984 an estimated 15 million commercial copies were selling annually. A 1978 survey concluded the average American home had four Bibles and almost all U.S. homes had at least one. 1 Terry Hall, "How We Got Our Old Testament," Moody Monthly, January 1987, page 32. 2 David Ewert, Ancient Tablets to Modern Translations: A General Introduction to the Bible, pages 29-30.